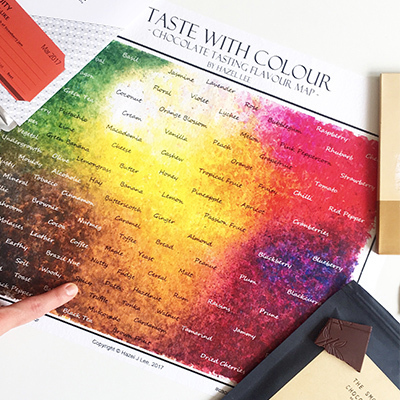 Taste With Colour with the Chocolate Tasting Flavour Map by Hazel Lee. When we taste single origin chocolate, the task of putting into words the extraordinary variety of flavour notes that we experience can be a daunting one. There’s often a lot going on, from muted tones to punchy expressions, and it can be tricky to distinguish even the familiar tastes that pique our palates. But fear not, for craft chocolate aficionado and synesthete Hazel Lee, has developed an innovative and oh-so-beautiful solution to help. For Hazel, tasting chocolate is truly a multisensory experience, with the flavours that she tastes triggering a visual perception of colours, which she then associates with the chocolate. Finding the words for flavours can often be a struggle, but through her extensive experience in tastings, she discovered that it was helpful to have possible flavour notes written out in front of her, helping to identify and verbalise exactly what tastes she can distinguish. This Taste With Colour map was developed as a tool to connect the colours that Hazel sees in her mind, incorporating 111 different flavour notes that she frequently encounters on her international explorations, tasting fine, single origin chocolate. This Map is sure to enhance your tasting experience, guiding you to be able to identify all the delicious flavour notes that you taste when you tuck in to your chocolate. This product has been crafted with care: Taste With Colour is printed on high quality 260gsm textured as a complement to the vivid watercolour design. Quite simply, chocolate is life for Chocolate Consultant Hazel Lee. A food scientist by training, Hazel’s craft chocolate journey began after volunteering with La Iguana Chocolate in Costa Rica. This life changing experience ignited a passion for world adventure in pursuit of the best chocolate, and today Hazel even experiments with her own bean-to-bar chocolate creations right at home. Hazel is a member of the Academy of Chocolate and a judge for the prestigious Academy of Chocolate Awards.